When Eric Senseman of Denver, Colorado toured the 33.4 miles Tortola Torture Ultra Marathon course on Friday—including climbs up Windy Hill to the 1528 foot turn around at Sage Mountain parking lot, then descend through Brewers Bay and over Ridge Road to Beef Island including Little Mountain—he figured he could do it in about five hours. and had the fastest split over every segment of the course—including 26 minutes and 29 seconds from the base of Windy Hill to Sage Mountain—and a 32:04 descent from Sage to Brewers Bay, en route to an overall 4 hours 45 minutes and 05 seconds time. 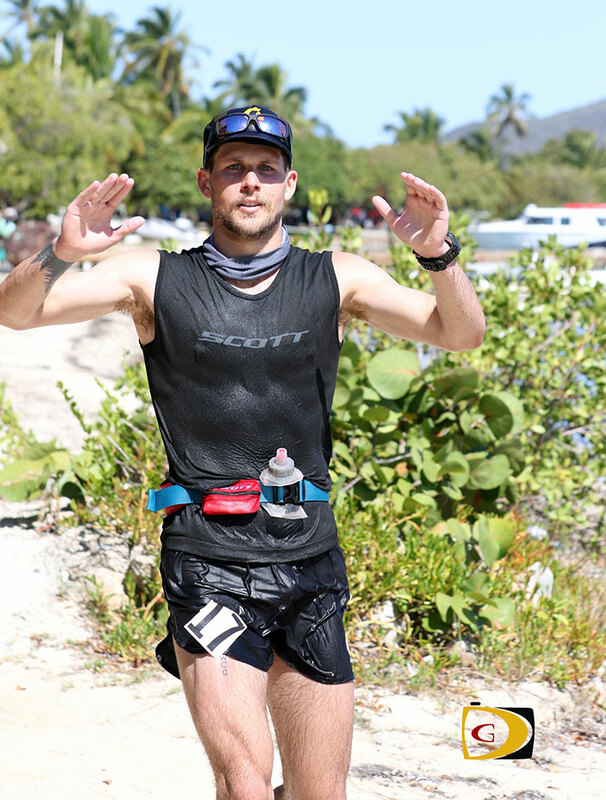 Virgin Gorda resident Vincent Fournier was second in 5:24.03 and last year’s winner, St. Croix’s Bridget Klein—the first woman overall—was third in 5:38.55 as the only three under six hours. He said after driving the course and noticing the first 13 miles was flat with small inclines, he figured he could run a 7-minute mile pace and 10 minutes for the final 18 miles. He said on the basis of past results and his fitness he determined the five-hour goal. He added: “The crazy thing is, when we asked Eric to come down, he had to ask his coach and his coach said yes, but, you’re not allowed to run at full speed because its mid season and he has other races to do and this was an add on. This was like a training run for him,” Morgan said. Top finishers. Men: 1. Eric Senseman, 4 hours, 45 minutes and 05 seconds. 2. Vincent Fournier, 5:24.03.3. Simon Cook, 6:25.55. 4. Sean Blanton, 6:29.14. 5. Mike Klein, 6:40.18. Women: 1. Bridget Klein, 5:38.55. 2. Claudia Ferrari, 6:33.10. 3. Judy Haycraft, 7:24.11.